SORRY! I NO LONGER SHIP TO GERMANY! The Sly Fox on the SPARK Records Label. Comes in a PLAIN factory sleeve. VERY RARE ORIGINAL OBSCURE PRESSING! 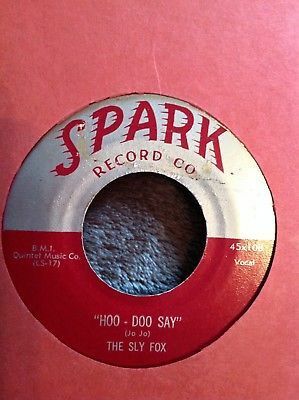 This is a MONSTER rare and obscure 45 by The Sly Fox (Eugene Fox). It is on the SPARK Records Label 108. This rare 45 beauty is in VERY GOOD + or better condition! The plain sleeve is near perfect condition with NO seam splits or tears. The labels are the ORIGINAL RED and are in excellent condition. Our starting prices are always reasonable. Very rarely will you see a "Reserve Auction". Auctions run for seven days. We Accept PayPal ONLY! Payment must be made within 72 hours of auction close unless other arrangements are made before the auction ends. LP's are removed from the cover and shipped outside of jacket in a inner paper sleeve. The cover and record are then placed in the plastic record protector. Finally, they are packed in the cardboard record mailer supported by cardboard stiffeners. The record is then packed well as for it not to move around during shipping! I do not profit from shipping and handling. US Customers: Shipping cost is as follows: $4.00 Media Mail (2-9 days) or $8.00 Priority Mail (3-5 days). US customers please be aware that Media Mail can take up to 12 business days to arrive (and on rare occasions even longer). In most cases it will arrive at your door within 5-6 days. I ship all items within 2 business days of receiving your payment. If you would like to receive your item more quickly, I recommend you select Priority Mail as your shipping option. International Customers: Shipping methods are First Class or Priority International. First Class cannot be tracked. Combine from our other auctions to save on shipping. Add $1.00 to original shipping fee for each additional record shipped in the U.S. Add $2.00 to original shipping fee for each additional record shipped overseas. PLEASE NOTE: WHEN A PACKAGE EXCEEDS 5 POUNDS, THE POST OFFICE ADDS ADDITIONAL COST! THESE COST ARE THE RESPONSIBILITY OF THE BUYER! (These additional fees usually apply to a package with 7 or more LP's). IMPORTANT! PLEASE TAKE NOTICE! IMPORTANT! All LP’s are guaranteed (unless otherwise stated in the auction). I stand behind the LP’s that I sell. You may return an LP in original condition for a full refund minus return shipping costs. You must notify us within 72 hours of receipt of the LP. We make every effort to ensure our customers are satisfied. If you have any problems or concerns, simply contact us and we will resolve the matter. Once we are certain that you are satisfied with your item(s) and your transaction(s), we will leave feedback. If you are happy with your transaction and would like to leave feedback, please do so. THANKS FOR STOPPING BY AND HAPPY BIDDING!